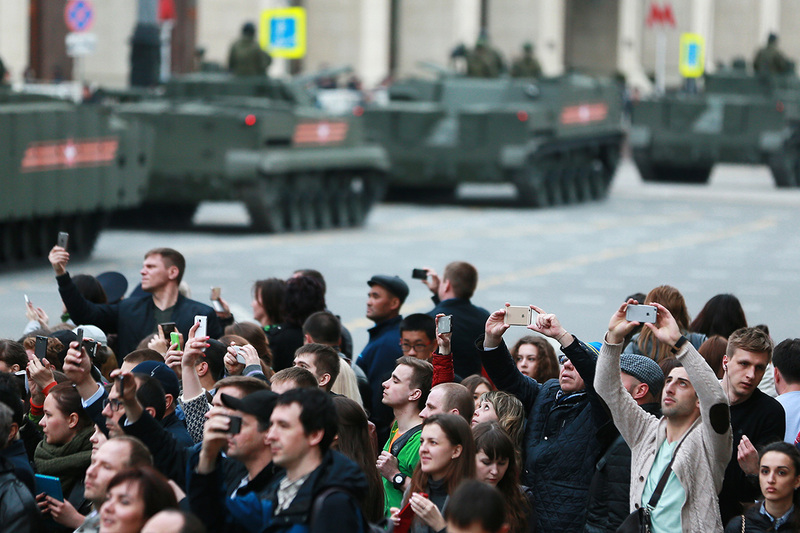 Muscovites and tourists are watching the rehearsal of the military parade, April 28, 2016. Seventy-one planes and helicopters will take part in the aerial part of the V-Day parade in Moscow, on May 9, Russian Aerospace Forces Commander-in-Chief, Col. Gen. Viktor Bondarev has said. "This is the 71st anniversary of the victory in the Great Patriotic War, so, 71 aircraft will participate in the parade," the commander-in-chief said on the Rossiya-24 television channel (VGTRK) on May 5. According to Bondarev, the parade will feature modernized planes and helicopters, as well as the brand-new military transport plane, Ilyushin Il-76MD-90A. "There will be things to look at," Bondarev said. A representative of the Russian Defense Ministry told Interfax-AVN earlier, "Sukhoi Su-24, Su-25, Su-27 and Su-34, Mikoyan MiG-29 and MiG-31, Antonov An-124-100, Ilyushin Il-78, Tupolev Tu-22M3, Tu-95 and Tu-160 and Sukhoi Su-35S planes and Mil Mi-8, Mi-26, Mi-28N and Mi-35 and Kamov Ka-52 helicopters will fly in a single air formation." The military parade will feature over 10,000 servicemen and more than 100 pieces of modern armaments and military hardware, including Tigr vehicles, T-90 tanks, BTR-82A armored personnel carriers, BMP-3 infantry combat vehicles, Msta-S self-propelled howitzers, Buk-M2 anti-aircraft missile complexes, Pantsir-S1 anti-aircraft missile and artillery systems and Yars missile complexes, the Russian Defense Ministry said. Prospective military hardware - Armata tanks, Kurganets infantry combat vehicles, Bumerang armored personnel carriers and the Koalitsiya self-propelled artillery complex - will cross Red Square. Traditionally, the parade's foot-mobile group will include officers, sergeants and soldiers from military formations, Suvorov and Nakhimov military schools, military units, and cadets from education establishments of the Defense Ministry and other law enforcement agencies. A combined group of female servicemen from the Russian Defense Ministry's Military University and the Volsk High Rear Military School (branch) of the Gen. of the Army Khrulyov Military Academy will march across Red Square for the first time.